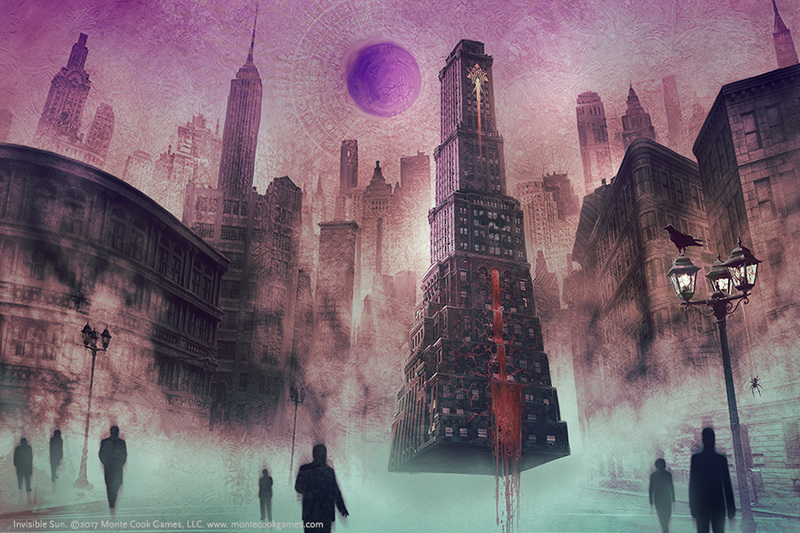 Last Tuesday, I wrapped up a two-month introductory adventure for Invisible Sun. It was my first time running the game, and all my players were new to it as well. One other had also backed the original Kickstarter, but this was his first opportunity to play. As with any first-time game, there were some inevitable rules errors on my part, and more pauses than usual to look up specific details in the books, but on the whole the group had a lot of fun, and I feel like the adventure concluded with a satisfying ending for everyone. 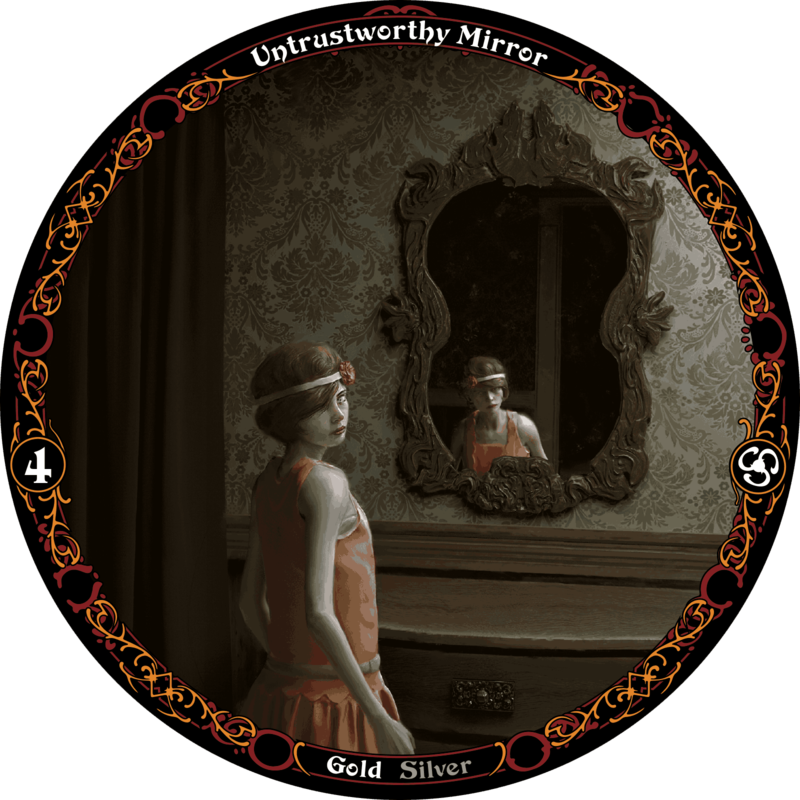 Invisible Sun is a game of surreal fantasy, with a heavy emphasis on the surreal. You play vislae, magicians who have awakened from Shadow, the lie that we believe is the real world, and have returned to the Actuality, where magic is everywhere. You live in a city made up of neighborhoods populated by strange houses, and where if you’re very lucky, the storm clouds above will rain down keys instead of water. Welcome to Satyrine, City of Notions. Characters choose a flavor of vislae, which determines the type of magic they have at their disposal. Vances are traditionalists who meticulously prepare spells from books. Weavers grab different threads of magic and combine them to create spells in an almost improvisational way. Makers create objects that are imbued with living spells. Gnostics focus on the summoning and binding of other magical entities to achieve their goals. And then there are Apostates, who refuse to join an order and instead pursue their own discipline separate from all others. The character creation system will feel familiar to players of Monte Cook’s other games, as Invisible Sun feels a little like the Cypher System on steroids. Your character is still defined by a sentence, and stat pools are still used to influence rolls, but unlike the other games, damage is tracked independently of the pools, and the characters have a number of other difficult decisions to make during character creation beyond what is typically done in Cypher. 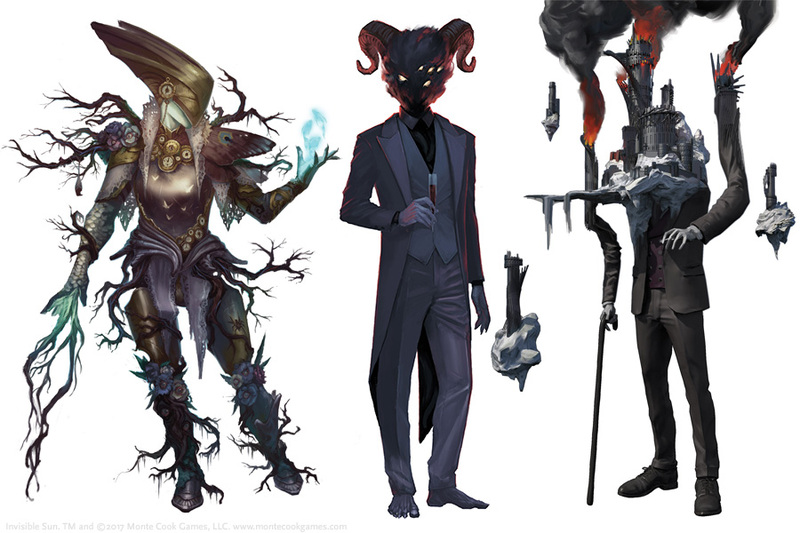 Monte Cook has said that while the Cypher System was designed to streamline character creation and get right into the game, Invisible Sun was intended to be a way to truly love and reward careful character creation. Vislae come in many forms. One of the significant aspects of any Invisible Sun character is the individual character arc. Each player needs to choose an arc that their character is straining for. While you can earn some minor upgrades and abilities just through accumulating experience in the form of Acumen1, but anything more significant requires Crux2. The primary way you accumulate the components of Crux is when you advance your character arc, so any advancement in the game is driven by the story of your character’s growth. As such, this requires a lot more investment on the players’ part, and each player needs to be very prepared with their character’s backstory and history as that is the narrative that drives the game. The GM does build a campaign narrative, but only with the intention of bridging the arcs together in a satisfying way. My short adventure was titled “The Shadow of Her Eyes”, and as suggested by the rule book, I had a number of NPCs and relationships in mind, but I didn’t try to lock them down until all the character creation was finished. 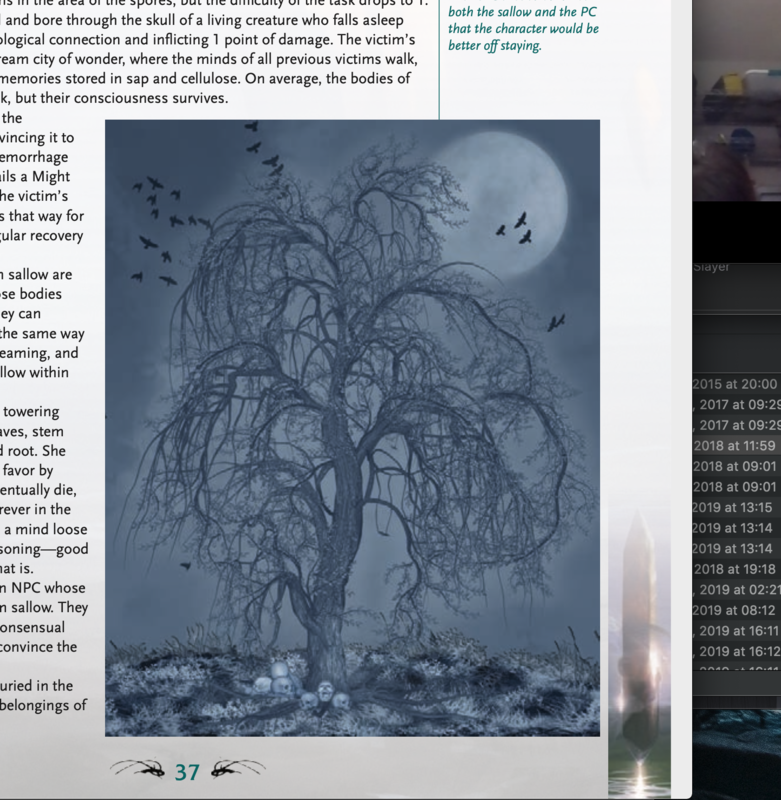 In Invisible Sun, the players do the majority of the character creation on their own, but none of them can be completed until the First Session. During that session, each character introduces their character (sans any secrets), and then the table works out the relationships between each of them. Then the player goes quiet while the rest of the table designs their neighborhood, defines their neighbors, and the GM figures out if their living situation represents Joy or Despair. At the end of each character’s creation, the GM hands the player a Wicked Key 3, and they in turn award it to one of the other players who they felt had a great idea about their neighborhood. The gamers were all experienced role-players and despite it being a new system, took quickly to the story and RP elements. In the game, there is another mechanic that we all enjoyed and that was the Sooth Deck, which is a tarot-like deck of cards that influences the power of different types of magic and elements of the story. A card is typically drawn for any significant scene change in order to flavor the play, and added to the feeling of surreality during sessions as GM divination became a significant factor in every challenge. The biggest challenge we had during the game was that since it was an introductory adventure, and the Invisible Sun books are quite expensive, having originally only been released in a limited collector’s box set (that was already sold out and pending reprint), it was very difficult for players to do things like select spells, and reference rules without the GM looking it up. I had to spend quite a bit of time creating cheat sheets for them. Luckily, during the reprint campaign, Monte Cook backed down from insisting the game be an artifact and did release the character creation book in PDF, and later even released all the books in PDF for those who did not want physical copies. This helped us, but it didn’t happen until after the game was halfway through, so the first half of the adventure put a lot of weight on me as a rules librarian. It was a very different story than I’m used to running. Typically I have a more structured plot that drives the narrative, but I found the improvisational challenge of threading all the character lines together to be very appealing. I can see why Monte Cook is adding the character arc as a set of optional rules to the revised Cypher System rulebook so that it can be used in other Cypher games. I do have some minor complaints about the game, but very few, as my biggest complaint (no PDF availability) has since been addressed. The books are beautiful, but I feel that the rules were not always laid out clearly, and important details were sometimes scattered across multiple locations. For example, rules around advancement via Acumen and Crux appear in multiple places, but there isn’t a good cross-reference in each section to figure out what you’re missing. This occasionally happens in other core-books, but usually you’re just looking through the one volume. In Invisible Sun, these rules are spread across four core-books, and while they each have a clear theme to guide you, it can be frustrating looking up an edge case for a specific rule. I would also caution a GM to be careful when recruiting players for a game of Invisible Sun. I was incredibly lucky with my group, but the amount of player investment required is much higher than other RPGs, and as such, you need players that love to inhabit a character. Players that love crunch over role-play will not enjoy this game and likely would make it less fun for the rest of the group as well. I truly enjoyed running this game. It’s a bit more work to run as opposed to traditional Cypher, such as Numenera, but still easier to run than Dungeons and Dragons. I think if I took it on again, I’d opt for a long-term campaign, so that we could really explore the character arcs to their fullest. That’s a project outside of my bandwidth at the moment, as I’m already running two other ongoing campaigns, but I look forward to returning to the Actuality in the future. If all this sounds appealing to you, I highly recomend you check out Invisible Sun and float the idea by your gaming group. It’s an investment in terms of both money and time, but is well worth it. Saddle Up! We’re on our way to the Ninth World.